Recently I asked my Facebook Audience how healthy they rated their homes. Today I’ll talk about four ways you can increase the health of your home. ** I’m a little more technical in this post, if the science is not your thing, skip on over the sections where I detail chemical names! When I speak about a healthy home, I typically mean the indoor air quality. If you live in an old house, like I do, then you’ll have a lot more air moving through the walls, windows and doors, but there is a larger possibility of materials used in the home that wouldn’t be allowed today. Lead paint and asbestos are the largest two concerns in an old home. If you live in a newer home and it was built to seal the air in, you hopefully also have an air exchanger installed to cycle the old air out and new air in to your home. Either way, there are plenty of ways that you can influence and change your indoor air quality. And it’s not just our respiratory health we need to be concerned about. The good news is that most of our indoor air quality can be controlled by us. Here are my top 4 recommendations for ensuring you have a healthy home. Scientists recommended that these products be avoided and to use a microfibre cloth and water instead!! I’ve found that not all microfibre cloths are equal. My favourite cloth is made by a company called Norwex and the cloth is considered an Ultra Micro Fibre (UMF) Cloth. I wholeheartedly believe this is the best cloth out there for cleaning and I’m not making money on this recommendation. They also make a glass cloth that effortlessly shines mirrors, faucets, stainless steel. First, wipe surface with a damp microfibre cloth and then wipe it with the mirror cloth. Simply amazing, and no more glass cleaner fumes! My friend Tuyen sells these products and you can check them out here. I still do use cleansers for some tasks, but I always use eco-friendly cleansers without the myriad of chemicals added. The main ingredients you want to avoid in your cleaners are: triclosan, quaternary ammonium compounds, or “quats”, phthalates, synthetic musks (scents), hydrochloric acid, phosphoric acid, potassium hydroxide, ethanolamines, ammonia and chlorine bleach! Yikes right? The Environmental Working Group is a huge resource for healthy living. They have health guides for a ton of products (food, beauty, cleaning, home health). Here you can enter your current cleaning product and see the health grade it’s been given and why. This tip is the easiest to incorporate into your life and will make a huge difference in your indoor air quality! 2. Paints and Floor Finishes. Before I moved to the US, I painted every room in every home I lived in. That was a lot of painting, a ton of colours and a few poor choices! One of which was the paint I was using. A lot of house paints still incorporate nonylphenol ethoxylates, formaldehyde-releasing preservatives, biocides, ethylene glycol, phthalates, “antifungal” or “antimicrobial” additives, crystalline silica and toxic metals, such as cadmium and chromium. Say, what? In plain language, paint has a ton of chemical additives! We were living in our home when we refinished the floors. Since I know I become nauseous and ill around intense chemicals and fumes, I chose to use a highly rated waterbased topcoat made by Bona on most of our floors. It is Greenguard Certified for indoor air quality. Because I have dogs who have injured themselves by slipping and sliding on hardwood floors, I used the non-skid formula and I’ve been pretty happy with the results. Though I still need to use rugs on their landing areas where they zoom up or down the stairs! In some of our other rooms and on our live edge floating shelves I used a topcoat by Vermont Natural Coatings, which is also Greenguard Gold Certified. Fun Fact: it’s made with whey and smells a little like buttermilk. It also dries super tough. If you are having your floors re-done, ask if the products they are using are Greenguard Certified. If you are doing it yourself, the Vermont Natural Coatings was easier to apply than the Bona product. With upholstered furniture, chemicals are often sprayed on to the fabrics and the polyurethane foam (found in cushions) is especially toxic. If aren’t working with an interior designer who can source healthy furniture and are purchasing retail, check out the Wood Furniture Scorecard. Top scorers include Crate & Barrel, Williams Sonoma and Ikea, among others, though this doesn’t address the level of quality of these products. The Kitchen Cabinet Manufacturers Association has a great search tool. They only guarantee that their products will be low formaldehyde, so another option would be finding a local cabinet maker and ask if they will use formaldehyde-free products along with non-toxic glues and finishes. That said, plants are on the bottom of this list because, while plants do clean our air, there haven’t been any studies on how many plants are needed per square foot to fully clean our air. I advocate for the inclusion of plants in our homes because studies have shown that plants are beneficial for our mental wellbeing by calming our nervous centre and improving our mood. I often hear from people that they have a hard time keeping plants alive, so here is a list of some of the easiest care plants. Golden Pothos – This plant thrives in a low light environment. Meaning; there is a window in the room and it’s not totally dark! Aloe Vera – Easy care plant, but needs a sunny windowsill! Snake Plant – Tolerates low light, but prefers moderate light. Meaning it should do fine anywhere you put it, as long as it’s not totally dark. It will grow faster with more light. Peace Lily – Tolerates a wide variety of light. They will not re-bloom unless it lives in a high light area (so a sunny windowsill or bright light near a window). It will live but not bloom in a low light environment. With each of these plants you should water them till the soil is damp, not soggy and then water again when the soil feels dry, but before it gets bone dry. Generally this is once every 7-10 days. Start small and each step you take towards a healthy home will increase the quality of your indoor air. Did any of the above surprise you? What will you change about your home? I (Lora Frost) am a complete and utter sustainability and healthy home nerd. When I discovered at age 18 how many chemicals were in our personal care products, I started my journey into learning as much as I could about more natural products as I would break out in hives every time I used my favourite shampoo. Turns out it was filled with Sodium Laureth Sulphate along with other chemicals and this was causing my hives. As a landscape and interior designer I am passionate about helping you create your own healthy home. Contact me here and I can’t wait to work with you! We are exposed to so many chemicals without our knowledge! This is an eye opener in so many levels. Thank you so much for sharing your knowledge! Yes, when you take a look around at everything that contains chemicals it can be alarming. Glad you were able to obtain some knowledge from the post. The one thing I could definitely use more of are house plants. Thank you for the reminder and all of these tips! House plants are a must in my home! They can really change your physical and emotional state. Happy plant shopping! Fantastic information! We do our best to live a healthy lifestyle, but there is always room for improvement. My goal for 2019 is to switch our family over to all natural body care products. What a great goal for the year. Bath products are the culprit of many problems. Great choice of change for a healthier lifestyle! Not many surprises but I am a health nerd like you! I do need to get more real houseplants to clean our air, though. The reminder is appreciated. Glad we could act as a gentle reminder to you. Happy house plant shopping! I use Aloe vera plants in my room growing it in a vase with our used coffee grinds as the soil. I am not sure whether the air is better but I do feel “healthier” in the mornings now. Am actually planning to paint my room soon so it’s great I read your tips. Thank you so much for this! Thank you for your response. Painting is aways a great venture to embark on. Best of luck to you. If you need help in selecting the color that is right for you we offer color consultations. Do not hesitate to reach out if you are in need of assistance. I have to say that most of these things surprise me. I knew about the cleaning products and I try to use eco-friendly cleansers as much as possible instead of conventional cleaners. I have heard so many great things about Norwex microfibre cloths and have to check them out! Yes, these things can be alarming. Norwex is amazing be sure to check it out I think you would love their products. Your post is really an eye opener on the various hazards that we are not even aware of.Thanks for sharing. Most hazards are hidden unfortunately. I am glad you were able to obtain some useful information. Thank you for the comment. I agree with paints. You should really pick which ones to use. As for the plants, we also have plants inside our house. We just change them regularly for another plant that’s on a pot outside. Thank you for the comment. Love the plant idea. It is good to be surrounded by living things. When I move I am focusing on house plants! This is the key to healthy living for sure! House plants can make all the difference. Happy moving and house plant shopping. Best of luck to you. I recently switched to a natural cleaner and feel much better about it. I didn’t even think of the paints in our home! The switch to a natural product can be liberating. Add some house plants and you will be one step closer to that healthier lifestyle! I try to clean every day so that dust and particles are cleaned on a daily basis. However, I had no idea about the laundry deal! Cleaning everyday can help tremendously. That is a great start. Making small changes can have a huge impact for a healthier lifestyle. Great job. I make sure there are indoor plants at home as it helps neutralize the air. Also, it’s very refreshing to the eye and nose. I agree I love how house plants make me and the room feel. Great job in having them in your environment. Thank you for sharing. Love this post, and thank you for the list of easy plants to grow. I kill almost everything I bring home. You are very welcome. Happy planting. You can do it! Such great information here – and helpful links to check out how different products “score”. Thanks so much! Glad you enjoyed the post. Check out the “score” of some items in your home, they may shock you. Smart boyfriend! Hope you have a happy healthy home with your plants everywhere. Such great information. With all the complications in life it’s nice to have a post like this that is an easy reference! Glad you enjoyed the post. Easy reference is important. 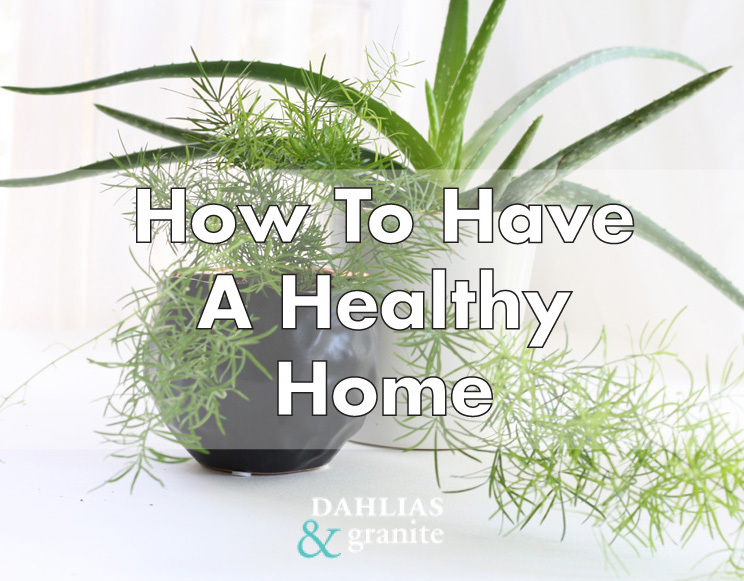 Hope you were able to take away a few tips for a healthier home. This is full of SO MUCH great information, and should be required reading for everyone. Not only do we harm our own health with these toxic products, tbut the health of our planet as well. Will be sharing, thanks for the great post! Wow what a great compliment. I appreciate your comment. I highly agree with you and hope a healthier life movement takes off soon. This is a great post! I really like how you included examples of what to use or where to find out more information. I’ll be sharing this one with family and friends! Thank you for your comment. I truly believe in the products I use. If more people can benefit from them also then all is well. This is such a great post, Lora. Thank you for the additional resource. One can never have too much knowledge. I appreciate it.